Last Sunday, Jon and I went for a drive to Marion Reservoir. We saw three bald eagles in the area of the north cove. 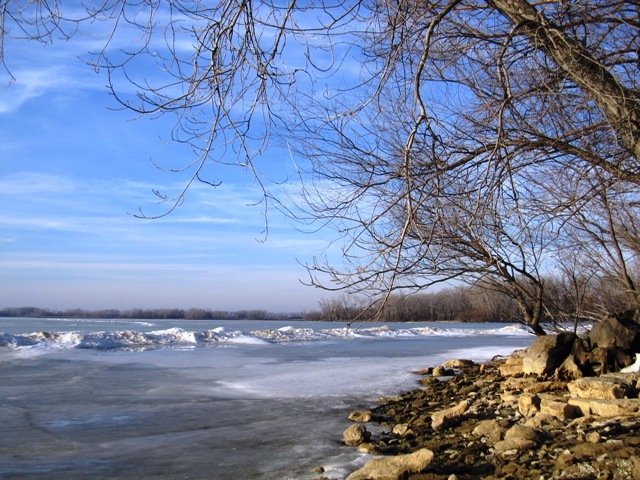 And for the first time since I’ve lived in Kansas, I saw the reservoir frozen from shore-to-shore. The pink clouds on the horizon were lingering fog. It was a beautiful afternoon. As I continue, a week later, to process that experience, I think about how much time our organizations spend in ditches. On one side of the road is rapid growth, change, and unpredictability. On the other side of the road is the status quo, rigid thinking, and control. Too much time in the ditch with uncontrolled growth and change will cause the organization to explode as the bubble bursts. Too much time in the ditch with the status quo leads to a slow organizational death from irrelevance and attrition. The challenge is to find ways of being that are neither reactive or rigid. To find ways of creating a road between the ditches. A road that is filled with energy for being flexible and adaptable while being coherent and stable. So let the road building begin. Let us find ways of improving organizational roads to support the middle way of “yes” and “and“. Let us find ways to stay out of both ditches and reach the destination.